I have a fear of being crushed to death in my home by reams of posters and prints that build up over the years. To resolve this, I'll be selling them here. In most cases, these will be hand-made silkscreen prints that are numbered and signed. And, at other times, I'll have photo prints in very limited editions. Also, if you happen to be interested in a head gasket for a '63 Chevy Nova, I got one of those laying around as well. I was approached by my old colleague, Adam Larson (Adam&Co), for a commissioned piece in the vein of my film prints to create a new piece for a boutique hotel in Boston. Like the other film packages, the original color plates are separated back out and placed at various scales and in wholly new orders. To build on this, I opted to show the ionic Polaroid color bars from the packaging as loosely painted lines which makes this feel a bit more dynamic. The original print is now up in Boston and this is the only other print made (and the only one at this size). Ships professionally packaged and rolled. 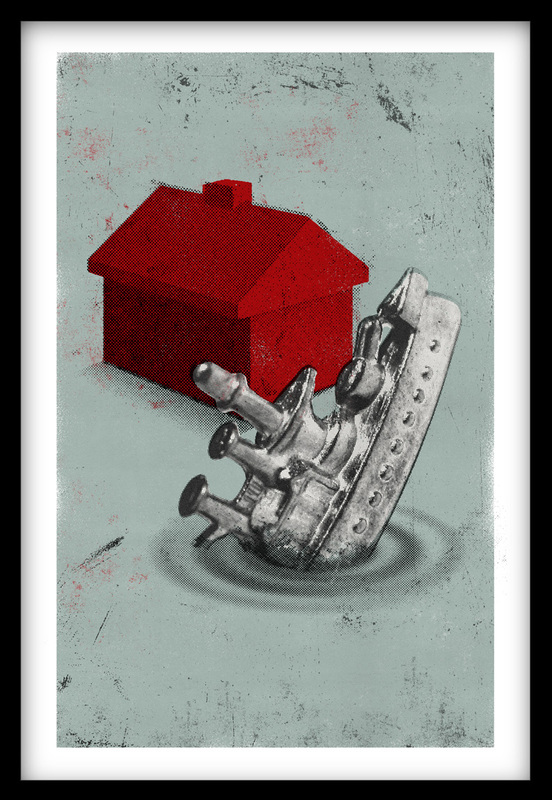 A short while back I did an art print inspired by my favorite retired film type: Kodachrome 40. Well, I really liked this process so I decided to create another print working in the same way. Like many starting photographers, I spent my time in high school and college shooting and learning with Kodak Tri-X black and white film. And, as much as I love Kodachrome 40, the ubiquity of Tri-X makes it both unavoidable and nostalgic. Like before, this print was created by separating the original color plates from a 1961 package of Tri-X medium format film (bought off eBay). Then, the color plates from every side of the package were repositioned on a single plane in various directions. The result is something that's part pop-art and part dadaist. The 50 prints are hand-numbered and signed. Something outside the usual concert poster. I wanted to start doing more art prints and picked one of my favorite now-extinct film stocks as the subject. This is the separated and enlarged Kodachrome 40 packaging color plates with the registration skewed 90º (creating something that's sort of dadaist and sort of pop-art). Letraset dry transfer type was popular from the 1960’s through the 1980’s (before all typography was done on computers). You would simply use a pen or burnishing tool to force the type off the plastic sheet and onto paper. I designed my first ever band flyer using Letraset in 1994 and continued to find uses for it on multiple Fillmore posters (as the tedious process creates these great human imperfections that would be hard to recreate digitally). So, as sort of an ode to this highly anachronistic tool, I took a partially-used character set I had laying around and made this print. The tool is now the art. This illustration started as a concept for The Frames, but remained unfinished until recently. I’ve borrowed the iconography of Monopoly ia few times over the years as it’s instantly reconizeable even when removed from its context. Fun Fact: The battleship Monopoly piece was one of the original game pieces from 1935 and was taken from another failed Parker Brothers game. 1 of 1 (only print ever made). Framed print comes with 24" x 36" black frame with archival-grade plexi. I grew up in Pennsylvania. I now live in California. For others like me (or maybe those who may of moved in the other direction) who want to keep both places in perspective. The quote is an excerpt from an article in The New Yorker (May, 1942). It's about a woman building a massive quilt made from articles once owned by (sometimes subjectively) famous people. This is the last line from the short piece and the prose of it just stuck with me. Not sure if it was a common term back in the 40's, but I felt it needed a bit of a spotlight. 20" x 24" digital archival print. The Fillmore in San Francisco has been handing out free posters at shows since Bill Graham opened the doors in the 60's. Some of the original poster artists (Wes Wilson, Alton Kelley, Stanley Mouse, Victor Moscoso, and Rick Griffin) created some of the most iconic artwork of the era and it has been an amazing honor to be able to do design work for this historic San Francisco venue. This is a package all of my Fillmore work and includes posters for Snoop Dogg, Tracy Chapman, The Cold War Kids, Jamie Cullum, Owl City, Norah Jones, Frightened Rabbit, Matt & Kim, The Frames, The Kills, Foster the People, They Might Be Giants, Built to Spill, Neon Indian, Stars, Black Rebel Motorcycle Club, Los Lobos, Old 97's, Ani Difranco, Thao & the Get Down Stay Down, Ingrid Michaelson, Blind Pilot, and Aimee Mann. All are the original Fillmore prints and will be shipped flat.